Southern Mom Cooks is growing by leaps and bounds! I am so proud of my little site and super excited every time someone links to me. 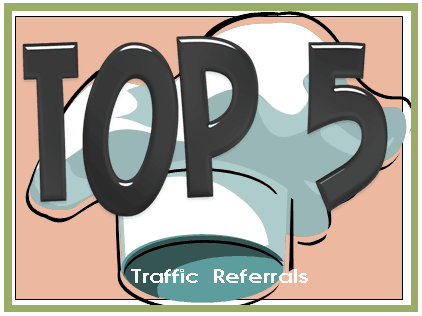 This is a thank you post to those that send me more traffic each month than any other sites! My top post in February was Minnie’s Keep it Clean Tilapia recipe with 5,824 unique visitors to it during the month! I received referral visits from 204 sources during last month! 1. 3 Boys and a Dog sent me 486 visitors in February! I was real careful to do some linking to it last month and it paid off making 3BD my #1 referrer to Southern Mom Cooks! 2. Crystal and Company sent me 228 visits! I link to the weekly Mommy Resources linky on Wednesday and it is really paying off! 3. Org Junkie sent me 217 visits in February thanks to my linking to her Monday Menu Planning Linky! 4. Gooseberry Patch sent me 136 – another linky each week! 5. Mom Endeavors sent me 116 – She featured my Cranberry Kiss Mocktail in a Valentine’s Day wrap up last month and ended up being my number 5 referral! Twitter sent me 6 (oh darn, down from last month’s 9! HA! I really should spend some time working on getting my @TheSouthernMom twitter following up, huh? I’m doing pretty well with Pinterest referrals. Thanks for sharing all this information. I am working on my SEO this month too, so it will be interesting to see how that affects my numbers. I think I need to check out some of the linky parties you mention that I don’t already attend. It’s fun to see our hard work pay off, isn’t it? Wow! That Pinterest stat is impressive. Congrats. Congrats! Your site certainly is growing. I’m sure it will continue to get better and better. Kelli – How inspiration it is to see your traffic growing naturally by so much!! Another great way to get more website traffic is to incorporate some good old fashioned offline methods, such as a putting a bumper sticker on your car. Keep up the fantastic work! !